Dr. Fausz holds a B.S. degree in Aerospace Engineering from the University of Florida, as well as M.S. and Ph.D. degrees in Aerospace Engineering from Georgia Institute of Technology. In past years, Dr. Fausz has served as the Air Force Research Laboratory Liaison to NASA at Kirtland AFB, New Mexico as well as Program Manager for the development of a simultaneous energy storage and pointing control system used for DoD satellite applications. 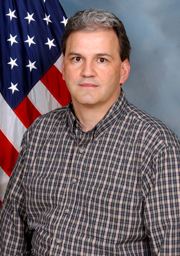 In addition to his duties with Apologetics Press, he presently serves as Engineering Project Manager in the Space Systems Development Division of Science Applications International Corporation (SAIC) where he manages several projects involving guidance, navigation, and pointing control design and simulation of spacecraft with imaging payloads, including pointing technology for military reconnaissance satellites. Dr. Fausz also performs engineering analysis of the NASA Crew Launch Vehicle (CLV). He has co-authored numerous articles for professional journals and is a Senior member of the American Institute of Aeronautics and Astronautics.